Wonderland – platform for european architecture, Vienna (AT) and MESS GbR, Kaiserslautern (DE) joined forces and invited international and local architects to debate the current vacancy in the shopping streets of Kaiserslautern and find new concepts for the shops of tomorrow. Wonderland combined in Kaiserslautern (DE) the events Blind Date and Project Space to focus on strategies, ideas and concepts to reuse the vacant shops in Kaiserslautern. For their second Blind Date MESS GbR (DE) hosted bauchplan ). ( (AT) in Kaiserslautern. MESS GbR installed an exhibition of the Call contributions for the Project Space Kaiserslautern 2011. 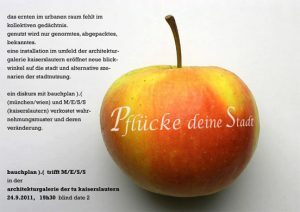 Bauchplan ). ( on the other hand transformed the Architekturgalerie Kaiserslautern and it’s streets with their artistic installation “Pflücke deine Stadt”. With a plastic film they wrapped information material and fresh fruits as well as nuts on the public street and in the gallery. 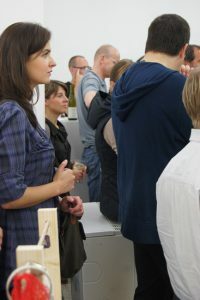 The audience was invited to pick a fruit and be aware of the space and the personal needs. Additionally a public dinner was staged on the shopping street of Kaiserslautern by the Blind Date matches MESS GbR (DE) and bauchplan ). ( (AT). 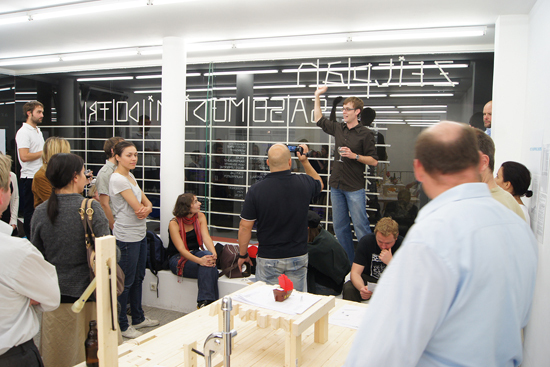 Project Space workshop participants were selected with an international call for ideas and were namely raumspielkunst (DE), 711LAB (DE), Licia Soldavini (DE) and edenLAB (DE). 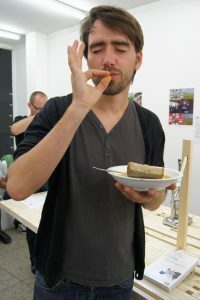 Régis Lemberthe (FR) decided ad hoc to join and contribute to the workshop. Two days were allocated for the workshop process, held at the gallery, ending with a final presentation on the 27th of September evening. As a result a multifunctional “dream space table” was constructed, where the occupants of a shop can read, cook, exhibit, eat, drink, write etc. The teams came to the conclusion that conventional shops need to enriched by non commercial and temporary functions. For this reason, a shop might not only have one but multiple users. In order to handle various users, a kind of week schedule was displayed on the window of the Architekturgalerie Kaiserslautern. For various activities the space of the gallery could be “borrowed” for a certain amount of time. Numerous citizens made use of the galery’s offer and some inquiries for the “dream space table” riched already during the public final presentation the organizers. The Project Spaces are complex and challenging. We want to thank everyone for their will and their contribution. Contact us for your Project Space idea.